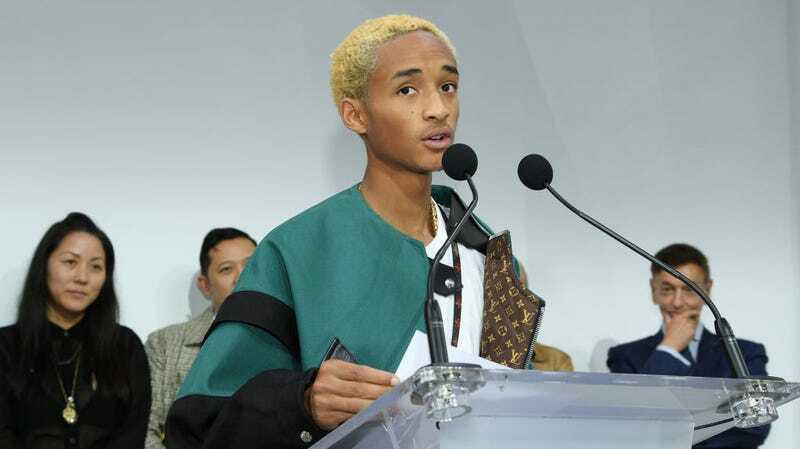 Jaden Smith, the young actor, musician, artist, and starchild of the endless cosmos, is known for tweeting fascinatingly bizarre nonsense. Somehow, even amidst the oceans of indiscernible garbage and bot-ridden missives barfed onto Twitter each day, Smith stands out. He is king of Mystery Mountain, figuratively walking around in a handstand while wearing pants on his torso, a shirt on his legs, and telling confused onlookers that only he has seen the truth behind all things. At long last, after years of cowardly journalists failing to do so, Huffington Post’s Bill Bradley managed to convince Smith to explain what, exactly, he’s trying to say through his years of online philosophizing. According to Smith’s interview response, this brutal critique of both mirrors and eyes actually makes perfect sense. Well, there it is. Perfectly clear now. While we’re sure the above response satisfies every possible question, not every tweet received even the most opaque explanation. Even this, a personal favorite from Smith’s oeuvre, was apparently typed and sent with clear intent. It is a guided missile zooming toward the heart of logic. The rest of the article contains similarly reasonable readings of memorable Smith tweets, though unfortunately, it fails to address several other beguiling hits from the past few years. No one piece can be comprehensive enough for that, of course. Instead, we’ll have to settle with what we’ve got: a reminder of how valuable a formal, entirely Hubbard-free education can be to a wide-ranging, thoughtful mind.